The following was written by Larry McCoy. Billy Joe Smith, a cousin of mine, died last week in California. Growing up, Billy Joe and I hung around together a lot. So did our families. His dad and my mom, the two youngest siblings from a family of seven kids, were the only ones still living in Frankfort, Indiana. Their five other brothers were either dead or had gone to Detroit to work. Billy Joe and I were the same age, in the class of ’55 at Frankfort High and on the football team. One summer, when we were 15 or so, we thought it would be fun to get on our bikes and go get ice cream. So we did. We rode to Lebanon, 17 miles away, had some ice cream and then rode home. Yes, it was delicious ice cream, and yes, I was sore the next morning. Two summers after high school, I ended up in Chicago, working at a super market because Billy Joe was in Chicago working at a super market. I remember being in his car one evening driving down Michigan Avenue with the radio on, listening to Howard Miller play one of the top songs of the summer. This was going to be terrific, living in Chicago where there was slightly more ways to get into trouble than in Frankfort. After serving in the Marines, Billy Joe made a career of working in supermarkets, mostly in California I believe. I saw him two summers ago at a reunion of the class of ’55. He looked fine and in good spirits. I remember at an earlier reunion the “girls” in the class were raving about how well Billy Joe and his wife Doreen danced. snow flake to hang on our tree. I think Billy Joe had a good life and Doreen was a major reason why. Sad news to relay. Paul Kilian died Monday, February 22, 2016. He had been in poor health for a while. I put this on Facebook the day after I heard the news. Paul Kilian, my best high school buddy, died yesterday morning. I don’t have a single bad or disappointing memory about Paul. He was always the same—energetic, friendly and endearingly corny. In a telephone call a few years ago after he developed health problems, I asked, “How do you feel?” “With my hands,” was Paul’s quick response. As kids we lived near each other and spent hours together walking to and from school. And talking. About girls, about our families, about what we wanted to do after high school, about the world. I was always comfortable with Paul and told him things I wouldn’t or couldn’t have told my brothers. We played side-by-side (he was a guard, I was the center) on the mighty Frankfort Nighthawks, a football team with a tradition of winning maybe three games a year. More than 60 years later I remember the glee on Paul’s face when he intercepted a pass one game and started running with the ball. In our senior year Paul and I were co-captains of the Nighthawks. Our coach was Jim Baldwin who wore three-inch thick lenses and drove the bus to our away games. Several of the geniuses on the bus, the future leaders of America, thought it would be brilliant fun to rock in our seats while the coach drove. I recall that Baldwin stopped the bus at least once and allowed as how what we were doing was stupid and dangerous. He cited no sources for this allegation. A couple of years after high school Paul and I lost touch. We were going to different colleges and living far apart and these were the days before instant communications-- cellphones, the Internet, Facebook, what have you. We both finished school, got jobs, got lucky in the companions we chose and produced children. 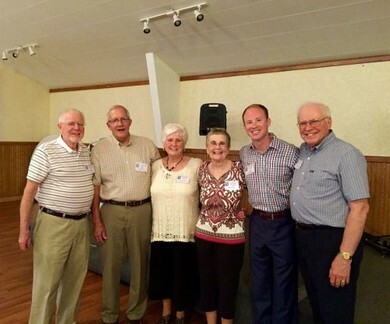 Years later we saw each other at a reunion of the class of ’55. Paul was like an old shoe, easy and relaxed, never trying to show off or impress anyone. I hadn’t seen him in 15 years or more and after five minutes it was as though we were back in high school, hanging out at Aughe’s Drug Store on the square, eyeing the girls and sipping cherry Cokes. In the last few years, I’m glad to say, we kept in touch more. On the phone or online Paul’s humor would cut through the nonsense, and he liked to rib me about my Democratic Party affiliation. We could joke about politics and the morons in both parties. It was always friendly, never nasty or an effort to score points. Imagine that. Civility and humor. During a class reunion in 2010, Paul and I had lunch with another classmate, Jim Ulm, who after Frankfort went on to graduate from the Air Force Academy and become a general. Our wives sat there while the three of us recalled two of our favorite high school memories—stealing pumpkins from porches one Halloween and smashing them on the principal’s front porch and getting awfully sick from adult beverages the first Thanksgiving we were all back in Frankfort from college. For reasons probably only understood by a man, the three of us remained proud of these misdeeds, and they were just as hilarious and marvelous 55 years later as they were when they happened. One of the interesting things about seeing Paul in my later years was he would always tell me what restaurants served breaded tenderloins, apparently feeling that living a long way from Indiana left me culturally and culinarily deprived. I usually seized the opportunity and ordered a breaded tenderloin, something I haven’t seen on the Panera menu. 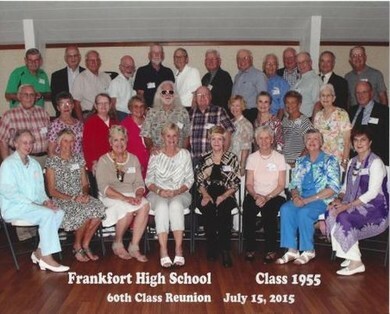 Last August the class of ’55 got together once again. Paul didn’t make this one, and I wrote him later that “when you don’t show up…everything jumps the tracks.” The envelope with the class picture arrived with a notation that $1.34 in postage was due, at least three of our women classmates were misidentified in the captions, and the month the picture was taken was also wrong. I told Paul all the guys in the picture were correctly named, though one of our classmates now looks like a member of ZZ Top. All these years later I remember one football game when I got hit hard and was woozy. Before Coach Baldwin sent me back into the game, he looked at Paul and said, “Take care of your buddy.” He did. My nickname for my buddy Paul was “Shoulders.” He had very round shoulders. Appearances are very deceiving. The man had very big shoulders, and his wife Pat and kids and grandkids know that. He was a dear friend, and I’ll miss him. Class of 1955 Breakfast at Hoops, 9:00am on the 4th Thursday of each month.